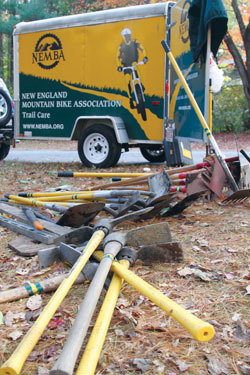 Help build a better New England for mountain biking - make your end of season donation to NEMBA's Annual Fund. We need your financial support to keep our organization strong and allow us to work for you to create better places to ride. Please show your commitment to mountain biking by making a tax-deductible donation today. We know that mountain biking is good for us, our communities, our kids, our trails. We can't imagine a world without it. That's why NEMBA exists - to protect the trails we ride, safeguard our sport, and create new riding opportunities. For that, we need your financial support. Your end-of-season gift to our Annual Fund will let us continue our advocacy efforts. Please support us with a generous donation to NEMBA's Annual Fund. As a NEMBA supporter, you're part of a community of mountain bikers committed to creating epic riding experiences, preserving open space, and guiding the future of our sport. You are NEMBA, and your donation allows us to keep working to improve mountain biking for our generation as well as for all the generations to come. 2018 has been a great year for NEMBA and for mountain biking. We continue to expand our capacity by bringing in new NEMBA chapters, training and supporting new volunteers and programs, and building more trails optimized for mountain biking. We launched our first-ever $10,000 Signature Trail Grant to create new trails and trail systems, and we just announced that we're doubling this for next season. Our focus on getting more women into the sport and into leadership positions has surpassed our expectations. We now have five women presidents of our chapters and many more taking on riding, trail maintenance, and outreach event management. Our Women's Leadership Summit last August brought together key movers and shakers to further our push to be more inclusive and to widen the face of mountain biking in New England. 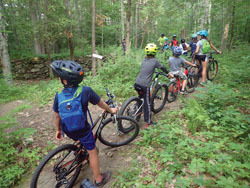 Our focus on families and younger riders is also getting more people involved with riding and with NEMBA. 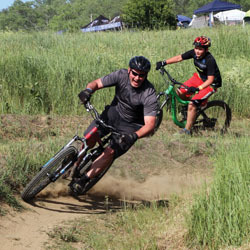 Not only has the NEMBAfest become the largest mountain bike event in the northeast, but it is also one of the most family-friendly events in the country. Kids are the future of our sport, and we're pleased that there are so many ways for them to get involved. 2019 promises to be even better. Keep your eyes open for information about our upcoming mountain bike summit on Cape Cod in April, open to all members. 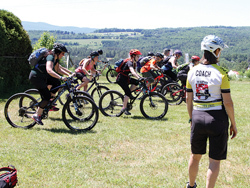 Come ride, network with new friends, hear about mountain bike issues and initiatives from around the region, and become part of what makes NEMBA so great - volunteer riders like you! Whether you live in the mountains of Maine or the southern coast of Connecticut, NEMBA is there to provide epic places to ride and new friends to ride with. 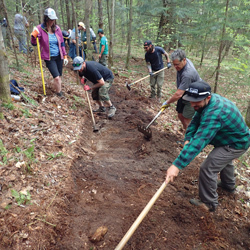 We offer 1000s of rides, scores of trail building days, trail building and skills classes, and network of riders willing to share their special stash of singletrack heaven. Your support helps us build a strong community and a strong voice for mountain biking. 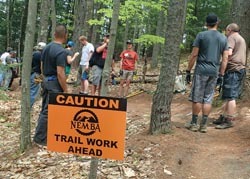 Perhaps most important, NEMBA is there to protect our access to trails. It's unfortunate that there are still those who would ban mountain biking. There are still groups and state agencies who do not want us on "their" trails. NEMBA is active, engaged and vigilant to ensure that sound land management triumphs over unreasonable agendas and bias. Your financial support keeps us strong so we can protect your access to trails. Please be as generous as you can with your donation. With your support, our next year of riding will be even better! PS. Donate $100 and you'll become part of NEMBA's Headcap Leadership Society and you'll also receive digital subscription to Dirt Rag Magazine. Donate $300 and we'll throw in a set of Maxxis Kevlar tires, or donate $500 and become one of the elite riders with a gold NEMBA headcap. However, we need and appreciate any size donation. Please give what you can. Also, check to see if your company matches your donation - this can be a great way to double or even triple your donation.